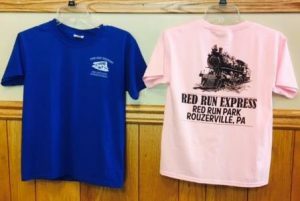 The Township is still in need of volunteer train engineers and assistants to keep the Red Run Express running on weekends at Red Run Park. The Township will assist and pay for your child abuse history clearance and criminal record check. Beginning MAY 6th, 2018 – the train will be running! The Red Run Express is scheduled to begin running this spring on Sunday, May 6th, and will run every Sunday in May. From Memorial Day to Labor Day the train will run Saturdays and Sundays including holidays from 1 PM to 4 PM weather permitting and volunteers being available. NEW! Red Run Express – T-shirts!! ($10 each) or need more information – Please contact the township office at 717-762-3128.